MOST children wouldn’t describe their primary school as “peaceful” or all their teachers and classmates as “kind”. But that’s how Bridgette Nicolosi views her new school. The year 4 student says she used to feel “confused” in her former mathematics class, but since she has learnt Transcendental Meditation at the Maharishi School in Reservoir, she is no longer as “scared” of maths as she was. She also feels more accepted and included. Fellow year 6 student Supreeya Bullock says meditation has helped her with schoolwork and in playing sport. Perrin Broszczyk says it has helped him relax and has improved his tennis. These students are making big claims but their positive experiences from two 10-minute Transcendental Meditation sessions each day is backed by a wealth of international research. Transcendental Meditation was developed by Maharishi Mahesh Yogi and was first taught in India in the 1950s. Pop group the Beatles extolled its virtues, writing almost 50 songs while studying with Maharishi at his ashram in the foothills of the Himalayas in the late 1960s. Hollywood stars Mia Farrow and Shirley MacLaine also took it up. It is practised by millions world-wide, despite Maharishi’s death in 2008. Some might regard the practice as New Age or bohemian but it has become mainstream, particularly in the US where it is used in some hospitals to help chronically or terminally ill patients manage their stress. Maharishi School founder and principal Frances Clarke says meditating in silence has profound results. Since the 1970s hundreds of research studies on Transcendental Meditation have been undertaken at more than 200 universities and research institutes across many countries. These studies report benefits such as increased creativity, intelligence and learning ability, higher levels of brain function, improved memory and school behaviour. Studies have reported an increased sense of calm, decreased anxiety and reduced conflict. 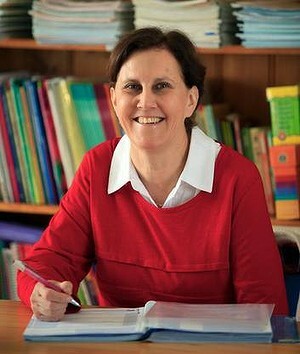 When Ms Clarke founded this independent school with like-minded families in Bundoora in 1997, it had 20 students. The school gained a following since moving to Reservoir, drawing families from local suburbs such as Northcote. It now has 80 students, rising to 100 next year. The school teaches the standard curriculum but adds a subject called Science of Creative Intelligence, and also the meditation sessions. In the extra class, students might do maths as part of learning such principles as that every action has a reaction. An ancient system of architecture and design known as Maharishi Vedic principles have been included in two new buildings. For example, they are entered from the east, capturing early morning sun. The principles are different but are along the lines of Feng Shui, in that they seek to maximise health and success. Ms Clarke first learnt to meditate at age 22. She found it helpful to deal with stress when she became a secondary school teacher. When she heard that the Maharishi School of the Age of Enlightenment in Iowa was getting outstanding results, she decided to visit. The Iowa school is open entry yet it continues to record some of the top academic results in the state and its students regularly win awards for sports, science, art and problem-solving competitions. TV star Oprah Winfrey has highlighted the school’s results on her program. Some US schools that deal specifically with Attention Deficit Hyperactivity Disorder have adopted Transcendental Meditation techniques after also witnessing its success at a Detroit Middle School. A Maharishi School in Lancashire, England, has performed in the top 2.5 per cent of schools for 25 years, despite also being open entry. As a result, the education department has fully funded it. Other Maharishi Schools are being established there too. Ms Clarke’s husband Larry, who has also taught Transcendental Meditation for many years, says it has a following in the US, Europe, South America and Thailand but has been slower to take off in Australia, despite the established benefits. Transcendental Meditation differs from some other forms of meditation in that it allows the mind to effortlessly “transcend thought”. “It does not require contemplation or concentration,” says Dr Clarke. He regards concentrating on breathing or an object, such as a candle flame, as an arduous practice where the mind is still active. Parents pay $1300 each term to send their children to this alternative school. At least one parent must practise or learn Transcendental Meditation also. The school offers a four-day course for parents. On weekends children meditate with their parents. She says parents talk to her about their experiences of meditating and it makes for a closer bond. Students sometimes get a shock when they move from this environment to high school. “They often express surprise that other students don’t want to learn and spend a lot of time mucking around,” says Ms Clarke. Article URLs: http://bit.ly/TBUgpw and updated http://bit.ly/RqwoWW. Earlier this year the Maharishi School was featured on Australian TV: Cool School: Melbourne school teaches meditation to students. Oprah came to the kindergarten through 12th grade private school around 11:30 a.m. Wednesday on a planned visit. She brought an entourage of film and production crews. Fairfield Police Chief Julie Harvey said Oprah’s visit included her trip to Maharishi School, a visit to the campus of Vedic scholars (the pundits in Maharishi Vedic City), a visit to a private residence, coffee at Cafe´ Paradiso and meditating in the women’s dome. She left Fairfield airport about 6:30 p.m.
Beall escorted Oprah around Maharishi School to the places she had indicated an interest in visiting. The crews mostly went separate, pre-assigned ways, he said. “She had an opportunity to watch the children’s meditation,” said Beall. “Then she participated in meditation with older students. Beall said a lot of cameras were around, but they all belonged to Oprah’s people. It was Oprah’s request to not have publicity about her visit. All MSAE staff were told not to bring cameras or gifts to school, another source reported. 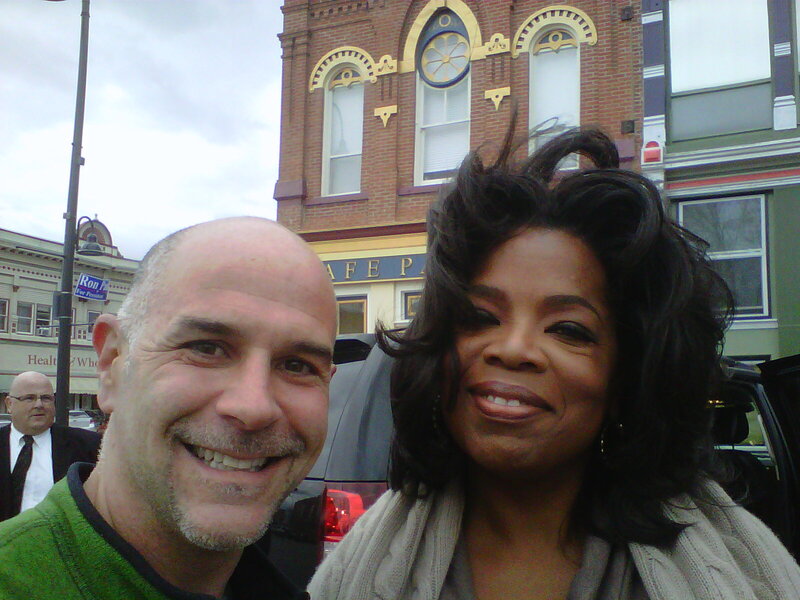 Oprah left the school around 1 p.m.
About three hours later, she was seen around Fairfield’s square. The Messerlis stayed in their car, observing. Messerli said they don’t watch the Oprah show normally, but have caught a few now and then. Married Maharishi University of Management students, Baruti and Mina KMT-Sisouvong had taken an afternoon walk and stopped at Cafe´ Paradiso about 4:15 p.m.
Two bodyguards and a few staff accompanied her. “She saw my sweatshirt and made a connection,” said Baruti. He was wearing a Morehouse College, Atlanta, sweatshirt. Baruti is a doctoral candidate and Mina is in the graduate program to earn a master’s degree in Vedic Science at M.U.M. “One of the nice things about Fairfield is people are very respectful here,” said Baruti. “Who ever we might see around town, we stay respectful. Those of us at Cafe´ Paradiso got to have a little time, sharing afternoon coffee. 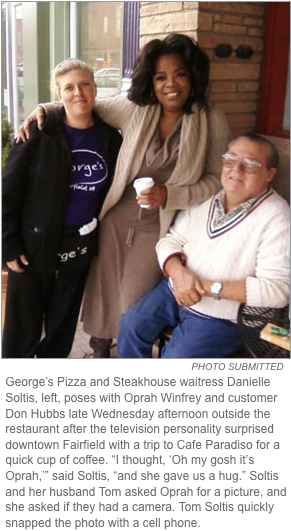 “Oprah sat down, people came up to speak with her and she was very friendly and welcoming. She ate and drank, and visited. It was very nice. “I walked [along the sidewalk to the dome for evening meditation] behind Oprah tonight. I didn’t realize it was her until she turned around near the gate and greeted us. ‘Work? Home? Homework?’ Oprah said, then laughed. We were all going to the women’s Golden Dome, a meditation hall here at M.U.M. Oprah recently learned Transcendental Meditation and wanted to experience meditating together with hundreds of women, so she joined us. It was a very sweet experience. The room seemed to be filled with more love and bliss than usual. My daughter, 19, especially enjoyed being there. It seems the younger generation were more excited about having her here; the college-aged were chatting away animatedly about it. KTVO: Oprah and her jet land in southeast Iowa | Oprah Jets into Fairfield and Meditates | Oprah Winfrey Meditated in Fairfield Iowa tonight with other Transcendental Meditation Meditators | associated content from Yahoo | The Associated Press: Chicago Tribune: Oprah travels to Iowa school for group meditation |KGAN CBS 2 News: Oprah travels to Iowa school for group meditation|Washington Examiner | The Republic: Oprah travels to Iowa school for group meditation, talks to students about spiritual journey, includes a Comment by Jean Welch Tobin: Oprah was so appreciative and eloquent about Transcendental Meditation. She commented on her experience of practicing the TM technique with close to 500 other women – over 2000 people if you consider everyone in the community. She said, “That was amazing, that was truly amazing!” | The Washington Post: Oprah Winfrey meditates with women in Iowa, talks to students about her spiritual journey | The Huffington Post: Winfrey meditates with women during Iowa visit | WHO-TV: OPRAH VISIT: Oprah travels to Iowa school for group meditation | TheCelebrityCafe.com: Oprah meditates in Iowa, and more. 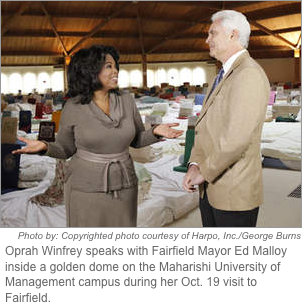 Here’s a PDF of a follow-up article in the Nov 23, 2011 Fairfield Ledger: Oprah’s network to air Fairfield footage. Here’s a link to a report in the MUM Review: Oprah Visits Campus; Program to Air Early Next Year on OWN. Some Reports on Dr. Oz’s Interview with Oprah about TM and her Next Chapter. Britain is set to get its first state school dedicated to the values of transcendental meditation. A private school run by followers of the Maharishi Mahesh Yogi will transfer to the state sector in September. The Maharishi School in Ormskirk, Lancashire, has been given the green light to be part of the first tranche of Education Secretary Michael Gove’s “free” schools. Mr Gove announced yesterday that 35 “free school” applications had received the go-ahead. In all, 249 applications have been received by the Department for Education to join the scheme. Under the “free schools” policy, parents, teachers and charities can open schools – funded by the taxpayer. 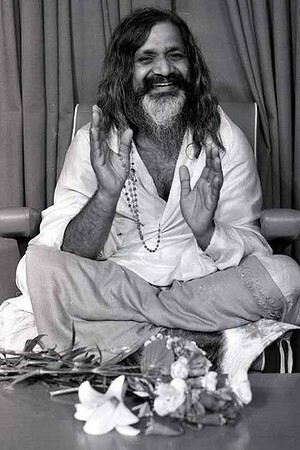 His school’s philosophy is that of the Maharishi, pictured, whose movement gained prominence in the 1960’s when The Beatles became converts. Mr Gove said ministers hoped every new state school would be an academy or “free” school. He spoke ahead of a conference on “free” schools today when he will be accompanied by leaders of the Charter school movement in the United States – which is advising ministers on the “free” schools’ policy. Charter schools do not recognise teacher unions, but Mr Gove said it would be up to individual school heads to decide if they do. US education experts said it was essential schools could “terminate” weak teachers. 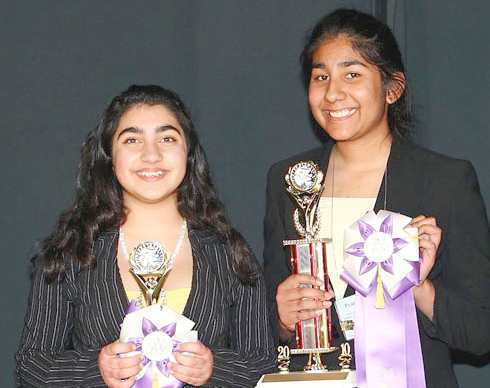 Pearl Sawhney and Minna Mohammadi, Maharishi School sophomores, swept the top prizes at the Eastern Iowa State Science Fair (EISEF) on March 21, as well as the State Science and Technology Fair of Iowa (SSTFI) on March 26th and 27th with their project entitled, “Farm Feeding Practices: Exploring Solutions for Environmental Sustainability.” They also won the most coveted prize – a free trip to participate at the INTEL International Science Fair in San Jose with their teacher and mentor, Dr. Mousumi Dey, on May 8th – May 14th. They won the following categories: first place and $100 at the EISEF, special prize: Iowa Environment and Water Pollution Board, first place and $100 in the Seminar Team Project category, the Power Point Hope Award, first place and $75 in the Environmental Science Senior High category, first place and $1000 for Senior High team, grand prize overall and $1000 in the Senior High category, Iowa Angus Auxiliary Award. Mohammadi and Sawhney were sponsored in part by Jefferson County Farmers and Neighbors Association. They received mentorship and testing materials from the USDA. Dr. Dennis Dey and Dr. Rajeev Sawhney provided additional mentorship. The research team examined the relationship between animal feed and pollution in streams. The project impressed and intrigued judges, as it is an area not previously researched. They tested three different types of farms: confined animal feeding operations, conventional farms, and organic farms. Here’s a shocker: One of the film industry’s most brilliant minds once felt anything but brilliant. While working on his breakout film Eraserhead in the mid-’70s, David Lynch had “everything I could ever want to make the film—the best equipment, the best place to live … but I wasn’t happy; I felt a kind of hollowness.” He began practicing Transcendental Meditation (TM), which let him connect to a creativity within that has inspired him throughout his career. In 2005, he created the David Lynch Foundation, which offers scholarships to schools to fund instruction in TM with the hopes of reducing stress and increasing well-being and creativity in children. Natural Solutions talked to Lynch about how meditation changed his world—and why he wants to pass it on. I like to say that ideas are like fish. The small fish swim on the surface but the big fish swim at the depths of the ocean. TM expands your conscious mind so you can catch the really big ideas. It allows me to effortlessly “dive within” and experience that ocean of creativity, intelligence, happiness, love, and dynamic peace. Mulholland Drive was first shot as a television pilot; the executive hated it and turned it down. I had the chance to make it a feature film, but I didn’t have all of the ideas. I went into meditation and after about 10 minutes, ssssst! The ideas came like a string of pearls. I attended a high school play put on by meditating students at Maharishi School in Fairfield, Iowa, and I was totally amazed at how bright and shiny, how natural and powerful, how much “themselves” these students were. Then I heard about the terrors of modern education, how afraid children are to even go to school because of the violence, drugs, and stress. So I wanted to do what I could to offer meditation to any student anywhere in the world. It’s done for 10 to 15 minutes twice a day as part of the school’s “quiet time” program. Everyone in the school benefits. I hear all the time about a child getting Ds and Fs, close to being expelled, and then he or she learns to meditate and, within a few weeks or months, she is getting As and Bs. The schools are transformed from being literally hellholes of violence and fear to centers of learning and creativity. That’s the report we get from principals and parents. It’s important for everyone to meditate, not just children. But think about how great it is to start your life developing your full creative potential, and growing in enlightenment, brightness, happiness, inner strength, intelligence, creativity, and dynamic peace. • Encourage downtime and regular exercise to trigger the relaxation response. • Educate yourself before considering meditation for your child. Check out tm.org for free workshops that explain the TM concept. • Visit davidlynchfoundation.org for school grant and scholarship information.